The DEQ has announced that it has found two new invasive species in Michigan rivers. The Pere Marquette River near Ludington has New Zealand mud snails and the St Mary’s river has didymo. Read the announcement here. Both of these species are very harmful to our rivers and the fish we pursue. To stop further spread of these invaders wash all of your equipment thoroughly, including your warders, boots and boats after getting out of the water is mandatory. We all fish multiple rivers, we need to be vigilant to keep the remaining waterways free of these pests. Here is an article expelling how to clean your waders. If we want to continue to have some the best fishing in the United States we are going to have to stay on this. Please tell your friends and fellow fishermen about this problem and be part of the solution! 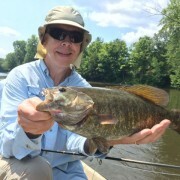 Smallmouth & Pike along the Manistee continue to chew on different types of baitfish patterns. New report is up. Salmon continue to trickle in, hunting them with big streamers is the only way right now. As numbers are low. But to escape the crowds plenty of open smallmouth water still to play around in. Pere Marquette trout are looking up for ants, beetles, and hoppers. But with the rain this past week the small streamer bit picked back up as well. In an effort to crack down on illegal fish snagging, the Natural Resources Commission approved new fishing gear regulations this year for certain rivers in the state. The Department of Natural Resources says snagging has become an increasingly big problem in Michigan. The DNR defines an artificial lure as a body bait, plug, spinner or spoon, on certain waters. These restrictions will only apply on the Betsie River, Bear Creek, portions of the Manistee River, and portions of the Big Sable River. “We’ve outlawed certain techniques that make snagging easier, in favor of techniques that we know the salmon will bite,” said Mark Tonello, a DNR Fisheries Biologist. Tonello defines snagging as trying to catch a fish by hooking it somewhere other than its mouth, rather than using legal angling techniques that involve trying to get a fish to bite the lure or bait you’re offering. Tonello says that ‘snaggers’ use things like a treble hook with a piece of yarn attached to it, or a chunk of lead with two treble hooks attached in order to snag fish out of the river such as salmon. Under these new restrictions, the snagging techniques are now illegal. If someone is caught trying to fish using these techniques, the DNR says they could be issued a ticket. “Now it will be easy for our officers if they come down to the river and if they see people using those techniques they can react appropriately, where as in the past they would have had to stand there until someone snagged a salmon,” said Tonello. There are times when trout are rising that you are unable to determine what fly they are eating. There are also times that trout aren’t rising much or at all that you would still like to catch fish. There is a tactic that we use to combat both of these situations. It’s the double fly rig. Many or most of you have used or heard of the “hopper-dropper rig”. That is attaching a bead head nymph to a hopper pattern and using the hopper as your strike indicator. It can be very effective at times. It works because you are presenting two different food sources in different water columns at the same time. We use the same method with two dry flies. This can be the same fly with two different life stages, two completely different flies or the same fly times two! It is deadly effective during a hatch, especially a light one. By presenting an emerger and a dun you are covering both bases. The emerger attracts lots of attention because mayflies are vulnerable at that stage. This method is also valuable during complex hatches. That’s when there are several different bugs on the water at the same time and trout are eating but you are unable to determine which bug they are eating. 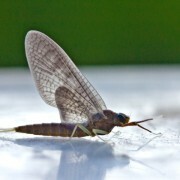 This can be common in June when there are several different mayflies possible during the evening. Sulphurs spinning along with bat flies doing the same, Isonychias hatching and/or spinning and maybe Brown Drakes. All of this occurring at dark. It can be tough to figure out which morsel the fish are eating! To present two dry flies at once tie a piece of tippet to the bend of the hook using an improved clinch knot. Make sure you moisten the monofilament prior to cinching it down to maintain maximum strength. See the video that explains how to tie this below. The size of the tippet should be either be the same size as the tippet being used on the first fly or one size smaller. I make the decision on size based on two things. If I’m worried about losing two flies I use the smaller monofilament so if I hook the bottom fly on something and need to break it off I have a chance of saving the top fly. If I’m casting to or searching for big fish I will put both flies at risk so that I have stronger tippet. Try this method, you’ll find it works! What do you throw before the hatch this week, I would suggest you throw a stonefly pattern. With a little bit of high water in the area with all the rain. Your going to need a big profile to grab attention. With water temps coming back on the rise after the weekends cold front, stoneflies will be hatching (crawling out) and then laying eggs in the afternoon and evening. Twitch a big stimulator around before the mayfly hatch. You might be surprised who comes up and eats it. Check out Ed McCoy’s Stonefly Stimulator pattern in this video for an easy tie. Hexes, and other big bugs! Hexes and other big bugs! 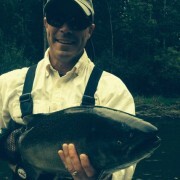 Manistee River trout fishing is some of the finest dry fly fishing that can be found in the Midwest. 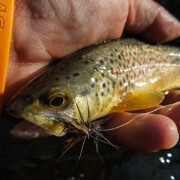 Trout can be taken on the surface regularly between April and October but Manistee River dry fly trout fishing really rocks when the big flies are hatching. Hexes, Drakes, and Isonychia mayflies provide Michigan fly-fishing anglers, some of the finest dry fly fishing to be found anywhere. For literary purposes I’m lumping together Gray and Brown Drakes, the awesome Isonychia, the mighty Hexes, and the lesser known Golden, Yellow and Green Drakes. These are the biggest bugs of the year from a size 12 to a size 6; these super-sized mayflies bring big, wary, brown trout to the surface to feed. That’s the good news. From there it gets a little more complicated. You need to know the habits and habitat of these bugs to be a successful “Manistee River Drake Angler”. The most numerous and famous of these mayflies are the Brown Drakes and the Hexes. Like the Green, Yellow and Golden Drakes, the Hex and the Brown Drake are all burrowing nymphs that live in the mucky areas of the river. So your first step is to locate those slower stretches of river where the muck is. Second step is to look for those areas with enough cover to hold big fish. Thirdly, figure out the drifts, ingress and egress from the river, and where to fight a large fish before it gets dark. When it’s dark out and big fish are smashing mayflies you need to know these things to be both safe and successful. 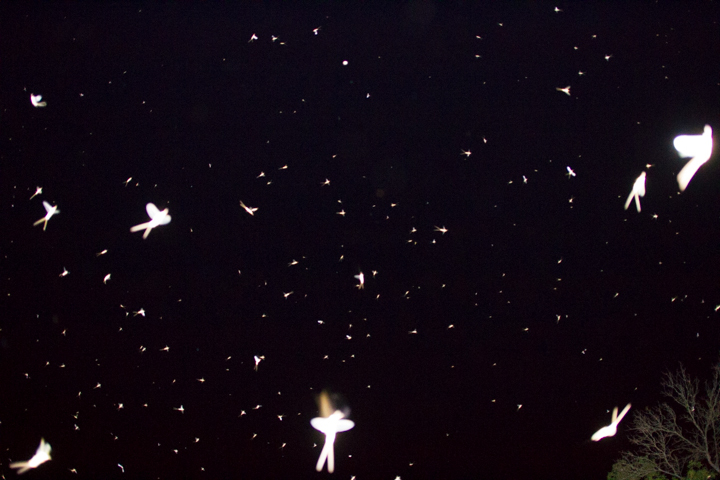 All of these mayflies hatch and spin at, or after dark so you need to be in the river looking for them well before dark. Be prepared to fish duns and spinners, many times they will both be on the water during the evening. To see an example of this watch some Hexagenia Video. You are going to be fishing to large fish at or after dark. A couple of tips to help you be successful. First use a short leader to help you control the drift. I use a 6 foot, 2X leader for the hex hatch or spinner fall. Secondly, wade as close to the fish as you can. The most common reason for failure is drag on the fly because you can’t see to mend correctly. If you can get close enough to high stick you will be dead drift. Identifying Brown Drakes and Hexes is easy, Brown Drakes have 3 tails and Hexes have 2. Both bugs have a yellowish cast to them with Brown Drakes a size 10 and hex a size 8 or 6. Because of the size of the hook patterns for both flies usually incorporate lots of buoyant material. Be careful of the heavily dressed “tourist hexes”. The trout usually won’t touch an overly dressed fly after a couple of days into the hatch. Gray Drakes live in opposite habitat. Look for Gray Drake Spinner clouds over riffles at dark. 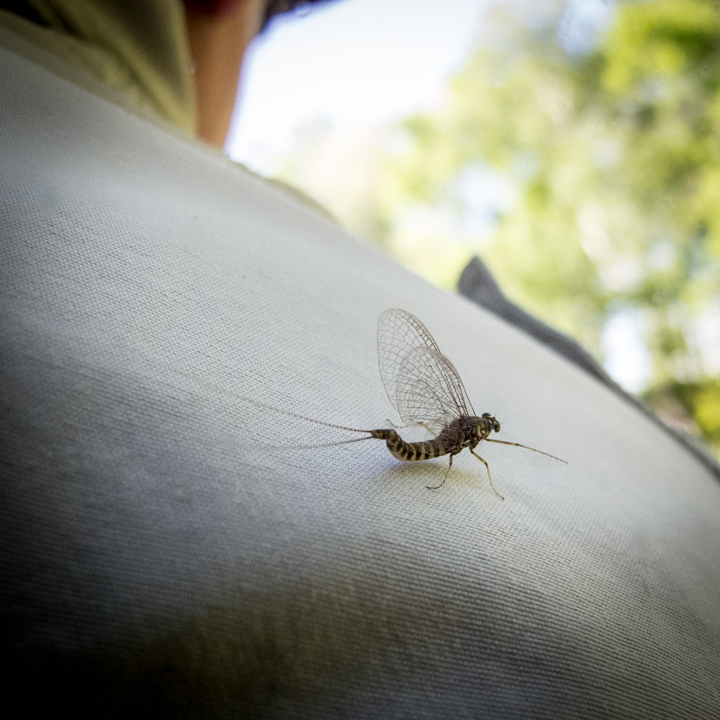 Gray Drakes are maybe the easiest bugs to identify; they are a size 12 mayfly with a white stripe around the head and eyes. Tie them with a very narrow, slight body. They are the skinniest of the bunch. Manistee River trout fishermen have arguably the best bug available for imitation by a fly angler. It is the Isonychia, also known as the White Glove Howdy due to its cream colored forelegs. The Isonychia is a free swimming nymph that sometimes crawls out of the water to hatch and other times you will see them hatching in the water. When it hatches it’s gray like an Adams and when it spins it’s mahogany colored. The Isonychia is one of those bugs that trout just love to eat. It must taste good! Isonychias spin just before dark. I’ve never seen a good Iso spinner fall that didn’t get the big fish up and eating. Look for Iso’s all of June and well into July in areas of heavy gravel. They like to deposit their eggs in the riffles. Isonychia nymphs can be fished very successfully by actively swimming the nymph into log jams and other heavy cover and stripping them out. Hang on, trout love these big bugs. Hawkins Guides are experts, we know where to find Hexes and other big bugs. If your interested in seeing them and going after the trout that like to eat them, give us a call. 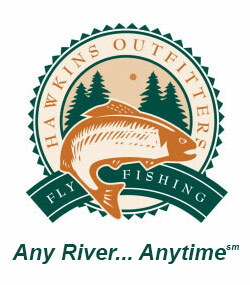 You can reach us at 231-228-7135 or email Chuck directly at chuck@hawkinsflyfishing.com. You can also reach one of our guides by using our contact page. https://hawkinsoutfitters.com/wp-content/uploads/2015/06/IMG_2068.jpg 480 720 Chuck Hawkins http://hawkinsoutfitters.com/wp-content/uploads/2014/12/hawkins-large2.jpg Chuck Hawkins2015-05-25 12:53:102019-03-20 14:57:21Hexes, and other big bugs!